Marcia and Brian’s home is now smaller, but they say their lifestyle is bigger and busier. 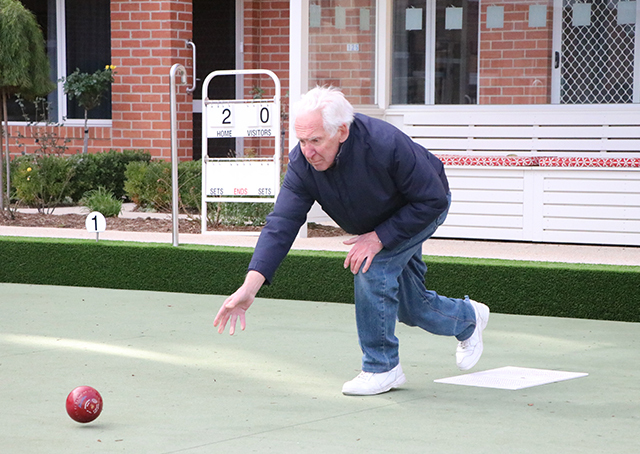 Weary Dunlop Retirement Village a year ago, they are loving a lifestyle they could scarcely imagine before they made the move. “Sometimes we actually have trouble fitting things in,” Brian says. and choose how to fill their days. On Saturdays, Brian plays table tennis with a long-time friend in the village activities centre; on Sunday mornings he plays snooker with his son at the village’s competition-size table followed by a catch-up over coffee. He joins friends for bowls on the village’s all-weather green on Mondays, and he and Marcia attend the village’s Triple-A exercise class on Wednesdays and Fridays. “Then there are a number of things, special events, that the village puts on, and the thing that some people find most surprising when we tell them is that none of this costs us anything apart from our fixed weekly fee,” Marcia says. When they lived in their family home, housekeeping and general maintenance was an ever-increasing burden. “We had a large house and there were two bedrooms and a bathroom that we weren’t using but that I had to clean,” Marcia says. The point they stress, however, is that they’re busy doing what they want. While there’s a never-ending array of activities and entertainment on offer at the village, nothing is compulsory. One day you might like to attend a Hawaiian-style barbecue to mark the end of summer; the next day you might just want to draw the curtains and curl up on the couch with a good book. For Brian and Marcia, the freedom to do as they please is the definition of independence. The village provides plenty of options for residents to keep busy, and one of the things the Halls enjoy most is the ability to use the village to entertain family and friends, just as they once did in their family home. order a tea trolley for seven people – no trouble at all”. The couple admit to having felt some trepidation when they first moved to Weary Dunlop but, as they mark their first anniversary of village living, those doubts have been more than dispelled. “I haven’t yet found anyone who doesn’t like being here and I don’t think we will,” Brian says.